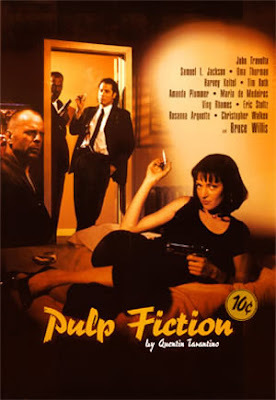 Irreverent, bloody, dark in its humour and non-linear in its story-telling, Pulp Fiction (1994) is a account of two days in the life of two hit men, a mysterious suitcase, their boss, an ageing boxer, two robbers, a big bad boss and his drug snorting wife. It all makes for a celebration with constant banter, parties, swearing, snorting drugs, getting killed, been threatened, disposing bodies - are all part of a day's work. For those looking to get inspired and taking that creative plunge off the cliff, here is your dose of inspiration. Unmissable for cinema buffs.